Despite the signs about Wild Elephants, there are walking trails. There was fresh elephant dung on and near this trail, and flattened grass areas that clearly indicated a presence of wild elephants in the past 24 hours. 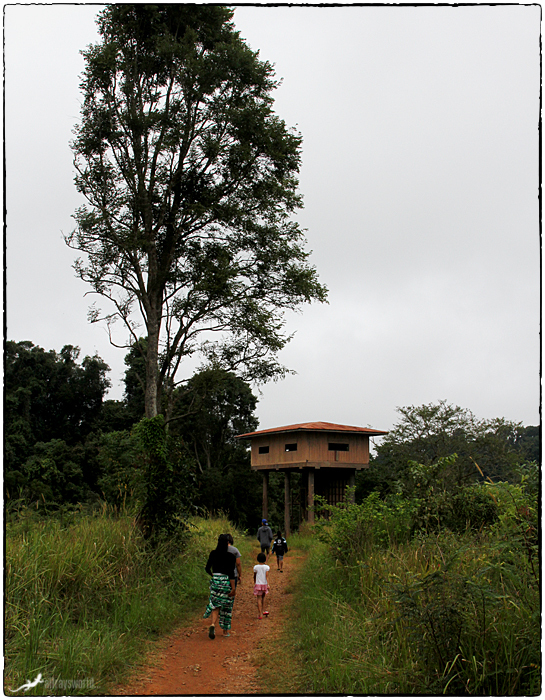 At the end of the trail is an elevated hut...useful as a lookout, or as a refuge from elephants. Elephants kill many more people in Thailand than do Tigers. Did you meet an elephant? I like Na's skirt! Ray: Encounters with Wild life is coming up in the series quite soon, Philine. Sod this for a lark! Ray: Where is your sense of adventure and your Stiff Upper Lip, Sir! That's an interesting fact about elephants. Will elephants attack regardless of any perceived threat? I think that lookout could do with with a helicopter pad on top in case the elephants mount a siege. Ray: The behaviour of Wild Elephants is not easy to predict, Alan, but ATTACK is certainly one of their options. Ray: Ça ira, Claudine ... ce qui pourrait mal se passer! I wonder why these giant herbivores are so aggressive. Ray: I think they like to control their environment, Martin. I expect the elephants are always reminding the tigers of this fact to wind them up Ray. Ray: I expect you are quite right about this, Chad. Ray: Wild Elephants are not gentle, critters, Bill. I think I would want to get along this path as quickly as possible to the tower. Ray: It was only 1km or so to the tower, and again on the return to the carpark, Brian...tomorrow you can have a breather in the tower. Hey, you are in the land of red soil. The top shot looks like any trail here. Ray: Yes. You will recall from an earlier shot of the red water in the river, that the soil on Khao Yai is red, Mary. Best be careful then, eh? Sure, Tom...but how does a bloke do that and still stroll along the tracks?